Adam Michaels is a founding principle of the New York-based design studio Project Projects, and the editor and designer of Inventory Books. Invalid Format: An Anthology of Triple Canopy, Volume 1 Did You Get the L? Wednesday, January 18, 6:30 p.m. The New York Society Library holds its third annual salon, featuring food and wine, conversation, visual presentations, and readings. Editors of Triple Canopy and the Paris Review will discuss literature old and new, on the page and on the Web. Triple Canopy will present its first literary—or not not literary—issue, Counterfactuals. Editors, along with contributor Tan Lin, will read and play audio and video selections from the issue. They will speak to Triple Canopy’s effort to cultivate new forms of literary work online and to undermine generic conventions. 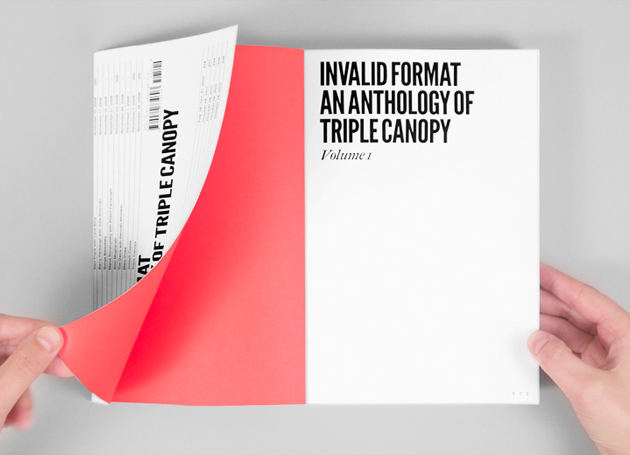 They will also present Triple Canopy's first book, Invalid Format: An Anthology of Triple Canopy, which explores how works produced for the screen might fully inhabit the page. The Paris Review will present its Winter 2011 issue, featuring interviews with Jeffrey Eugenides and Alan Hollinghurst and fiction by Roberto Bolaño and Clarice Lispector. Paris Review contributor Avi Steinberg will share the colorful and peculiar history of the airline safety card, with accompanying slides. A casual conversation with the audience about how literature evolves—or fails to evolve; or should resist evolving—along with shifts in the way we read and write, and the machines we use to do so, will follow. How to print an Internet magazine is the problem addressed by Invalid Format: An Anthology of Triple Canopy. Triple Canopy editors Alexander Provan and Peter J. Russo will read selections from Invalid Format and discuss its genesis and form with the book’s designer, Prem Krishnamurthy, and Adam Michaels of the firm Project Projects. Krishnamurthy and Michaels will, in turn, discuss how Project Projects makes productive use of the tension between new and old print technologies and design conventions in its work, which ranges from exhibitions to pamphlets, websites to catalogues.